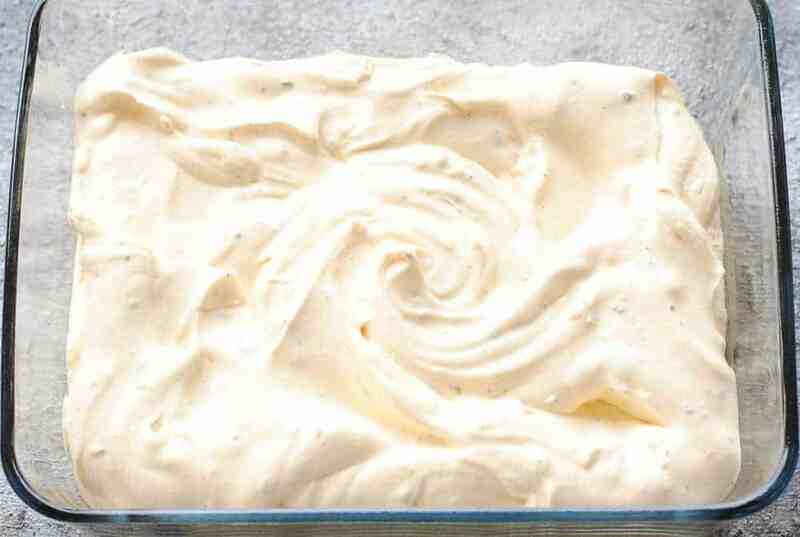 Kesar pista kulfi is the creamiest, dreamiest Indian ice cream you can make at home. This is a no-cook instant kulfi recipe with condensed milk, cream, saffron, cardamom and lots of pistachios and almonds. Sure to wow everyone from kids to adults and a real treat for hot summer days! Summer’s not far away now and what better way to beat the heat than ice cream? But not your Plain Jane vanilla or strawberry ice cream. Nope. I find myself craving malai kulfi, the Indian version of ice cream because the flavours are so refreshingly different. Here’s an easy-peasy saffron and pistachio kulfi recipe (kesar – saffron, pista – pistachios) that will melt the most hardened-against-ice-cream-hearts! It’s ridiculously simple to make with just a few ingredients. whipping cream – 473 ml tetra pack with 35% milk fat, not low-fat. saffron – dissolved in a tablespoon of warm milk. This is what will add loads of flavour and a pleasing yellow colour to your kulfi. green cardamom – peeled and ground into a coarse powder. There are so many ways to serve kulfi. I like serving it in waffle cones or waffle cups as in this recipe. You can enjoy your kulfi and eat the bowl too! Or fill some popsicle moulds with the kulfi mix and freeze for a stick kulfi that you can lick. You can also serve it in tall ice cream glasses. Up to you, really. a no-cook, easy kulfi recipe – traditionally kulfi is made by simmering milk until it is reduced to half the quantity – a labour intensive process. With condensed milk, the kulfi mix comes together in a snap and needs no cooking time. 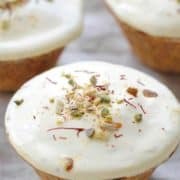 pleasing flavours – saffron, cardamom, almonds and pistachios together make for very pleasing flavours. 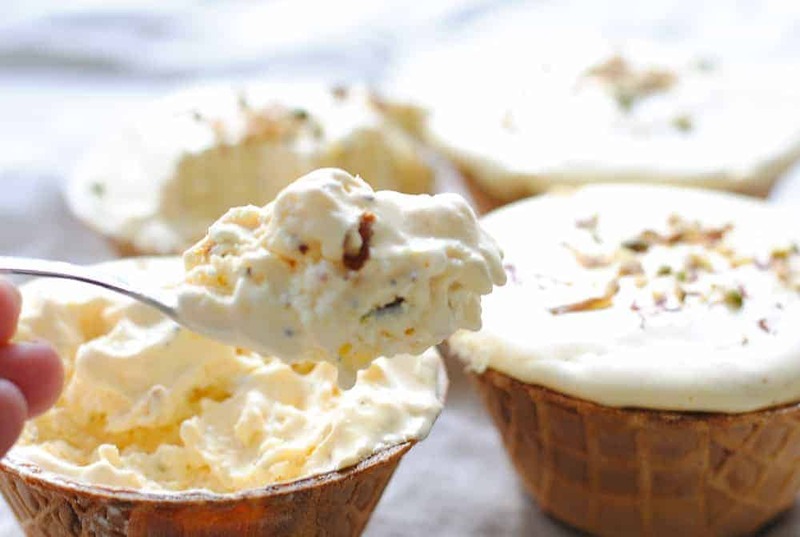 waffle cups – kulfi looks pretty in waffle cups and the cups are an extra treat after the kulfi is gone! zero ice crystals – normally when you make kulfi with milk, ice crystals form during freezing time. Because this kulfi recipe is made with cream, ice crystals do not form at all. Guaranteed! soft serve scoops – this is the softest, smoothest and creamiest possible kulfi ice cream you will have. Get ready for a magical sensory experience! 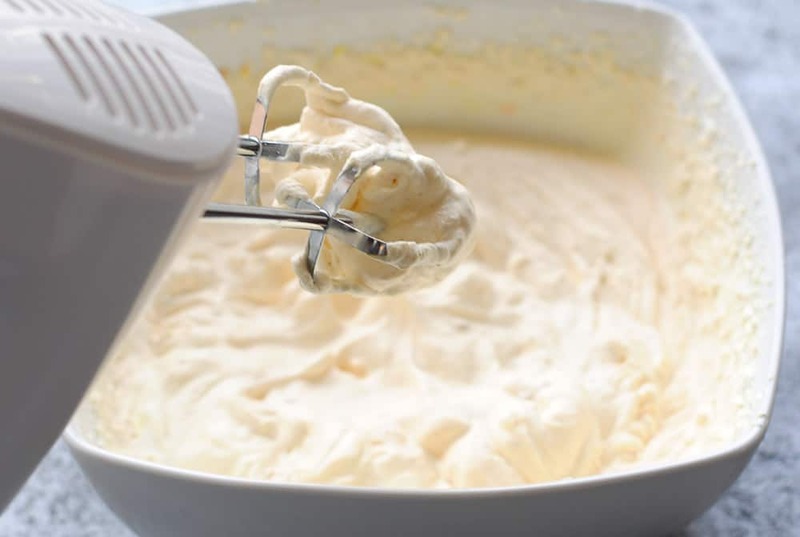 Step 1 – Beat the cream on high for 5 minutes or until the volume doubles. 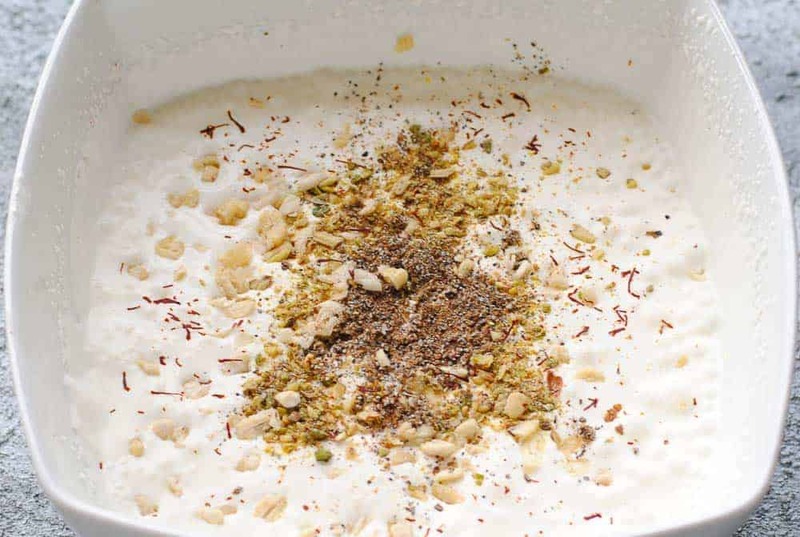 Step 2 – Add the saffron dissolved in milk, cardamom powder, chopped pistachios and almonds. Whisk lightly. 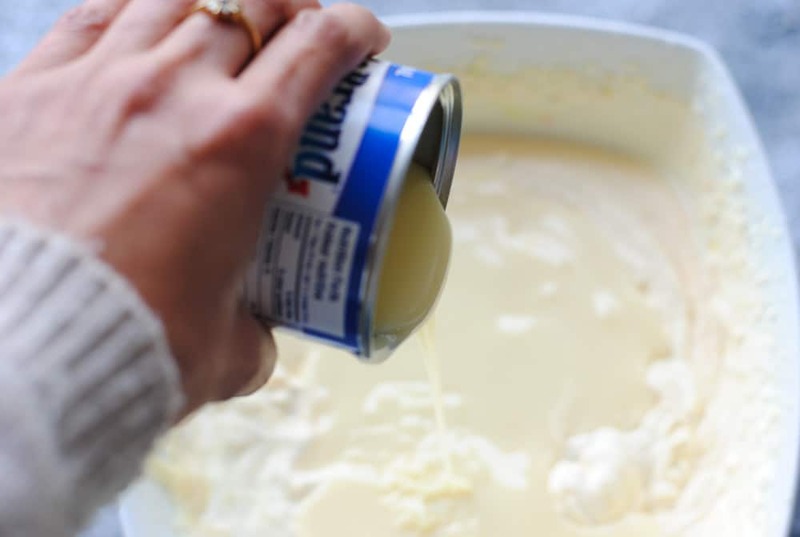 Step 3 – Pour the condensed milk and beat again until soft peaks form. Step 4 – Transfer the kulfi mix to a freezer safe container with a lid and freeze for 5-6 hours or overnight, preferably. 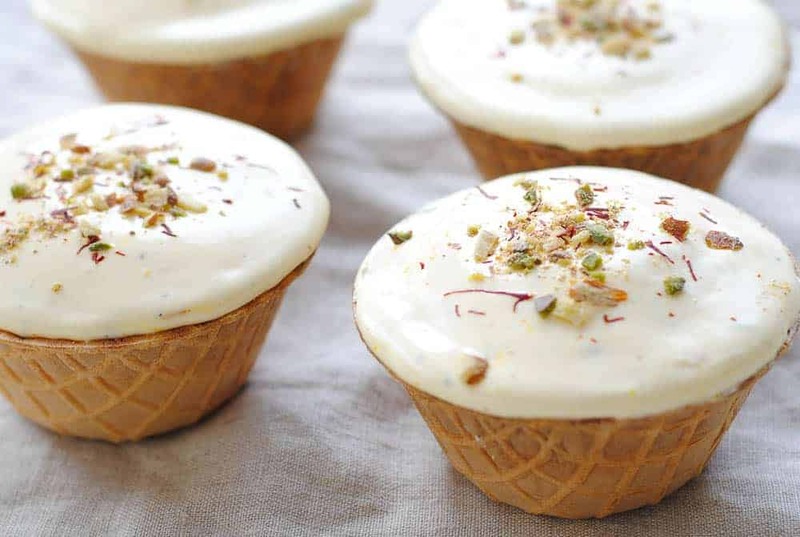 Step 5 – Scoop out the kulfi into waffle cups and garnish with chopped pistachios, almonds and a few strands of saffron. Enjoy! Choose good quality saffron. This is what adds loads of flavour and a pleasing golden colour to your kulfi. Be patient. Like any other ice cream, kulfi takes time to set. Give it at least a few hours in the freezer before you take it out. Avoid opening the freezer door too often while the kulfi is freezing. If you don’t like saffron or do not have it, add a pinch of deep yellow food colour to the mix. It will give a bright tinge to the kulfi but won’t enhance the taste like saffron, of course. This recipe is heavy on nuts, but you can add fruit to the cream as well. Mangoes are a popular choice. If you are making mango kulfi, take half a cup mango pulp and add it to the cream. If the mango is very sweet, use only 3/4 can condensed milk, not full or else the kulfi will be too sweet. Kesar pista kulfi is the creamiest, dreamiest Indian ice cream you can make at home. This is an instant kulfi recipe with condensed milk, cream, saffron, cardamom and lots of pistachios and almonds. Keep a few strands of saffron aside for garnishing and dissolve the rest in 1 tablespoon warm milk. Peel the cardamom and crush to a powder in a mortar and pestle. Chop the pistachios and almonds. Keep one-half aside for garnishing later. 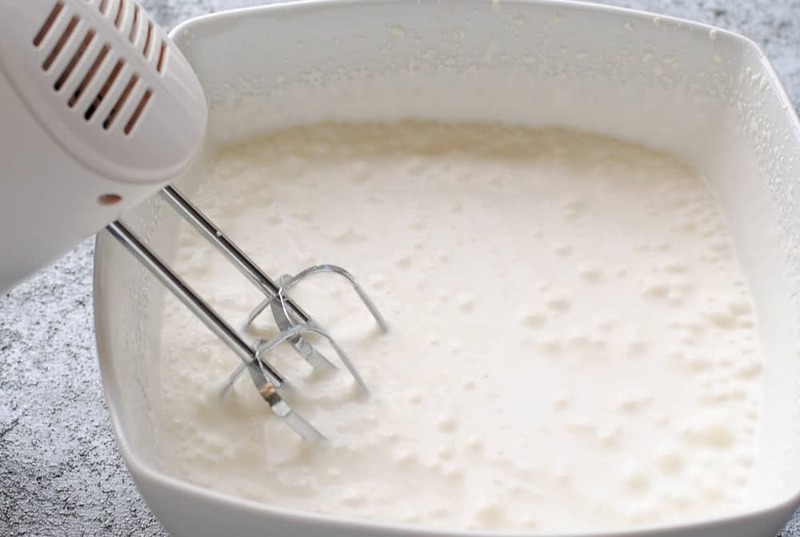 Pour the whipping cream in a big and deep bowl and beat with electric beaters on high for five minutes or until the volume has doubled. Add the saffron dissolved in milk, cardamom powder, one-half nuts and whisk gently. Add the condensed milk and beat again for 3-4 minutes or until soft peaks form. Transfer the kulfi mix to a freezer-safe dish and keep in the freezer overnight. 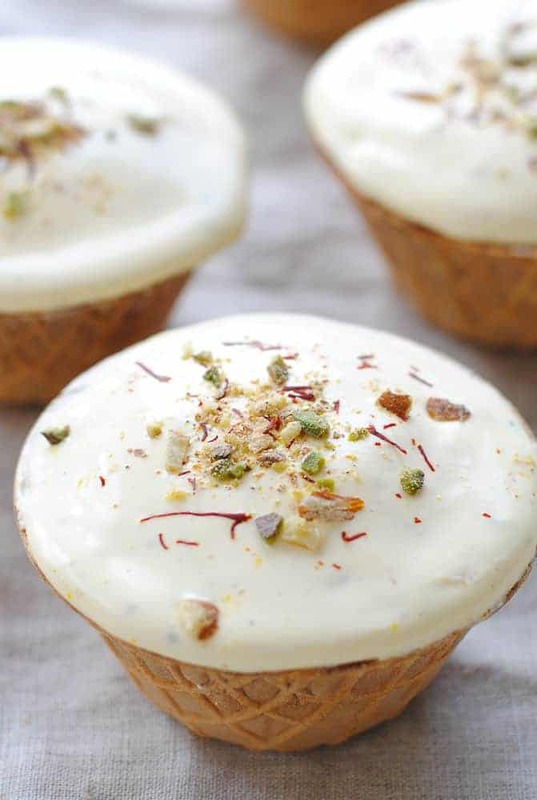 When frozen, take out scoops of kulfi in waffle cups and garnish with the remaining saffron strands and nuts. If you don’t want to go to the trouble of peeling and crushing the cardamom, pistachios and almonds, buy ready made packets of all three. Ground cardamom and chopped nuts are available in Indian grocery stores. 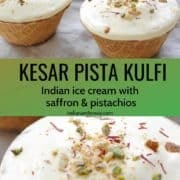 Did you make kesar pista kulfi? Don’t forget to give it a star rating below! Looks so delicious and unique! Can’t wait to try this recipe! I have never made Kulfi before – it is a favourite of mine though! Such a beautiful dessert – your recipe sounds so lovely. I can’t wait to try this, the flavors here are some of my favorites, but I’ve never had them in ice cream!